STERIS is a leading provider of infection prevention and other procedural products and services. The company is focused primarily on healthcare, pharmaceutical, and medical device Customers. They were a sponsor and exhibitor at the 2018 IAHCSMM Annual Conference held in Phoenix, Arizona. 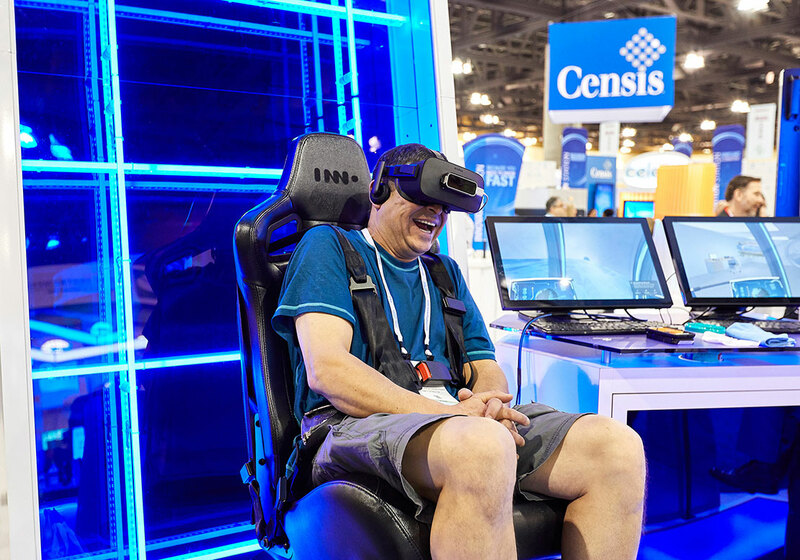 CEI has worked with STERIS over the last several years to provide interactive applications for their sales team in the field as well as Virtual Reality experiences for use at trade shows. 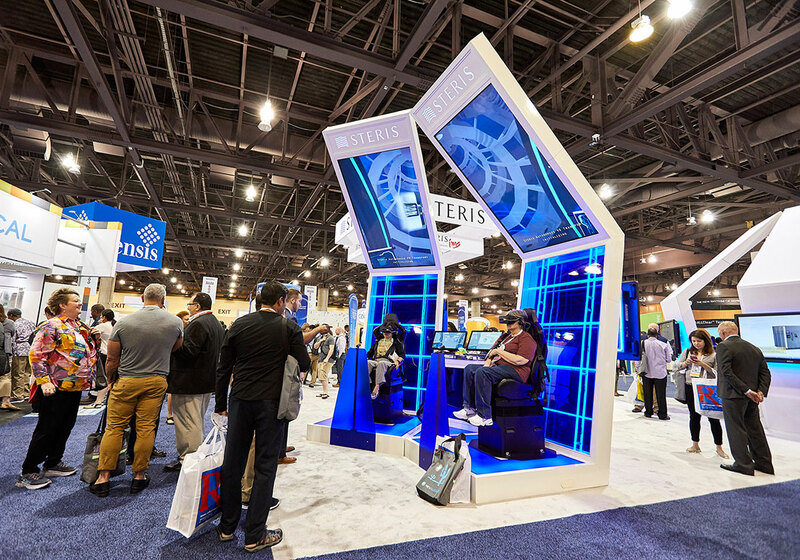 STERIS was looking for a new way to drive traffic, educate attendees, and encourage conversations with their in-booth product experts and sales staff. STERIS asked CEI to do something new and exciting. They wanted an experiential area that would differentiate them at the show. The target audience in attendance for this show consisted of managers and supervisors who are directly responsible for the purchase, supply, maintenance, and distribution of instrumentation supplies and equipment for hospitals, clinics and surgery centers worldwide. It was important to grab their attention and differentiate STERIS from other exhibitors. 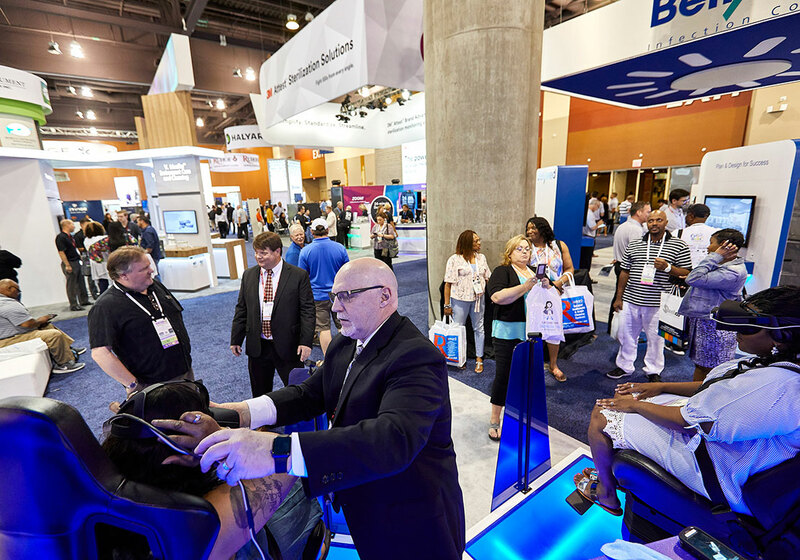 We needed to increase the amount of time spent in the STERIS booth, gather survey data and leave attendees educated on their products. CEI knew creating show buzz would be critical. Our team had less than eight weeks to deliver results. We put together a four VR pod stage area that would be situated along the main aisle in the show. Each pod had a 90″ monitor suspended above the user, an Oculus VR headset, a LEAP hand sensor for natural interaction, a computer-controlled chair, and dramatic branded lighting. 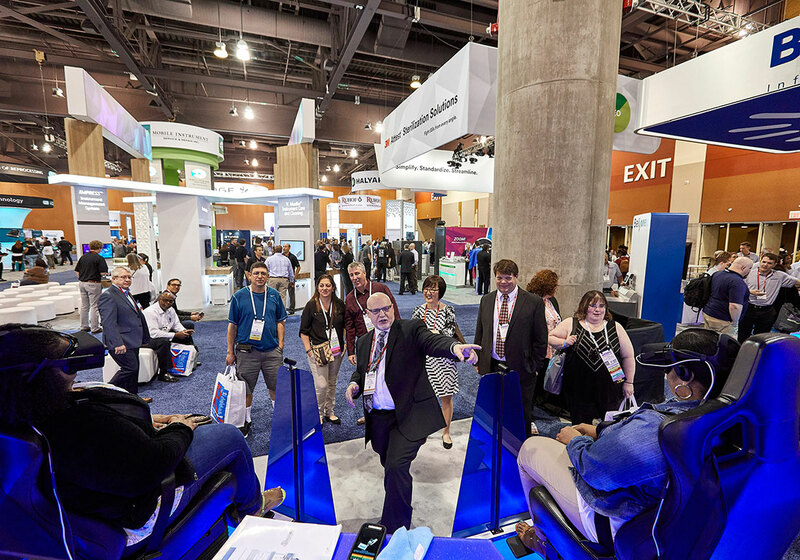 We created an educational six-minute VR experience that took attendees through a typical hospital’s Washer Room, Sterilizer Room and IMS area where they were able to learn about STERIS’s products. We added in a bit of fun as well by creating a roller coaster transition between the three hospital rooms. The out of the box roller-coaster transition between rooms kept the experience fun while still delivering educational content. 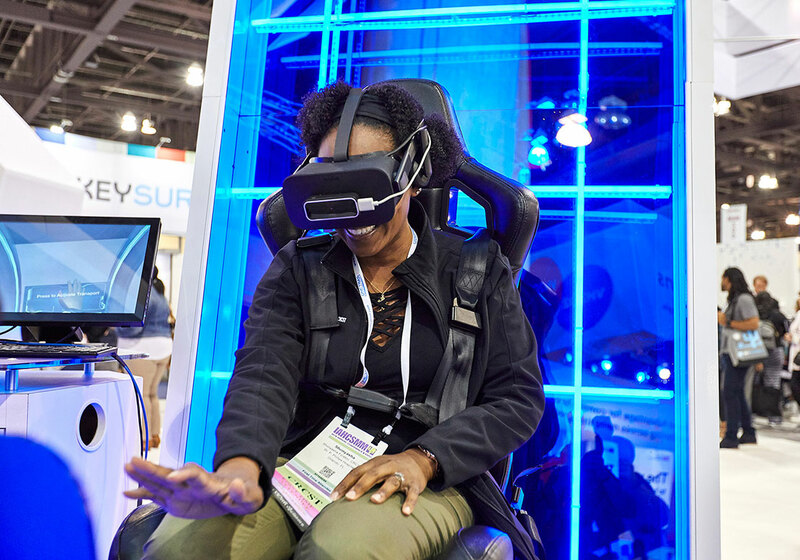 STERIS processed 154 attendees through the VR experience in eight hours of open show floor time spread across two days. The VR pods were 100% utilized during all show hours resulting in 918 minutes of strong brand engagement, that’s just over 15 hours of viewed content. While attendees waited in line to try the experience, they took a survey providing invaluable marketing data. 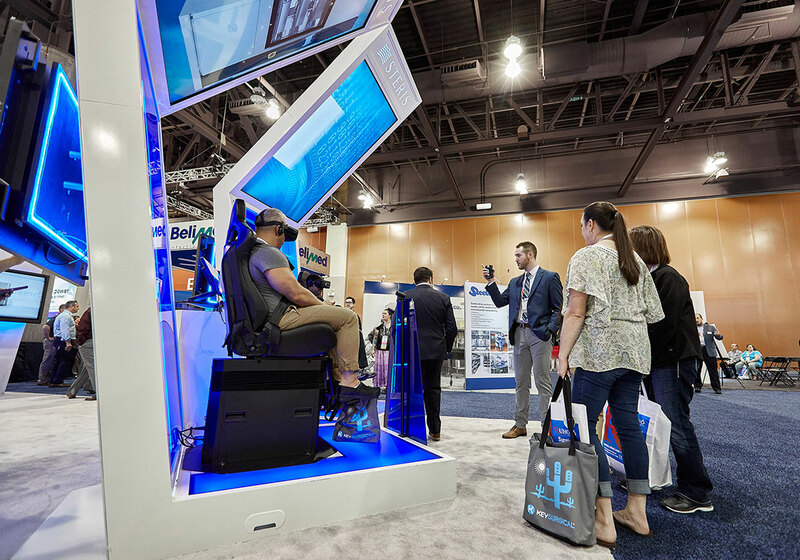 In addition, the VR experience acted as a lead funnel pulling attendees into the central area of the booth where various product experts could answer questions and further the sales process.